Body length up to 10'-12'. 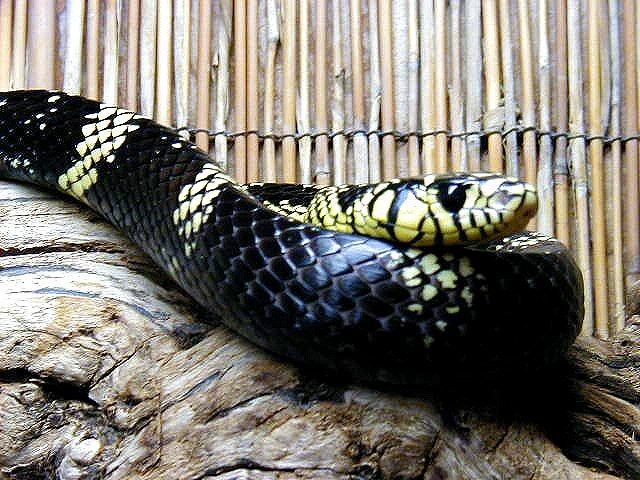 Color: alternating yellow and black patchy bands, diagonal over the midbody and becoming vertical at the tail. Head is usually yellow with very big eyes. Underside of snake is white with black stripes. 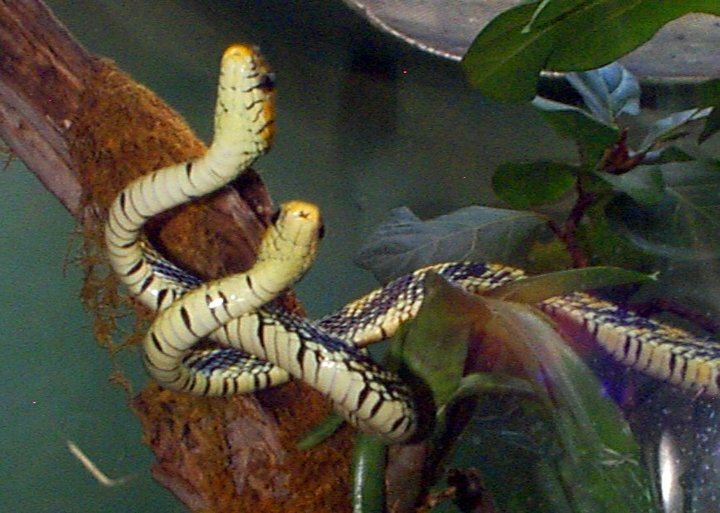 The Mexican Tiger Rat Snake is one of the longest snakes of the Americas. 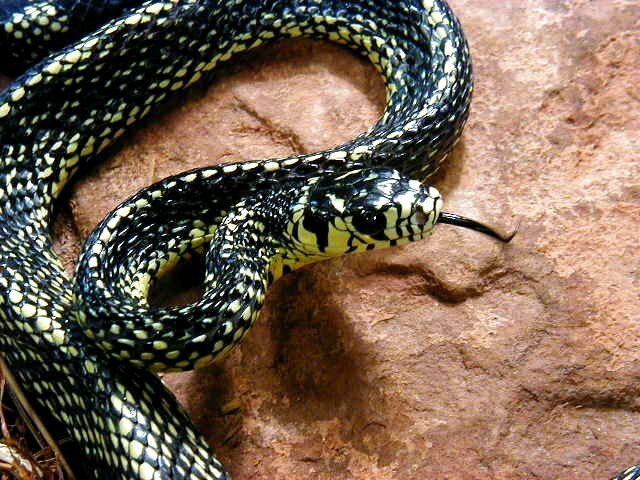 Since the snake lives in areas with tall trees and vegetation, their special color patterns of yellow and black help them blend in perfectly with the speckled sunlight shining down through the trees. This particular species of snake is usually very docile when left alone, but when provoked they will shake their tails (despite not having a rattle) and hiss very loudly. They can also inflate their necks dramatically. If this does not warn off the intruder, then the Mexican Tiger Rat Snake will strike repeatedly. 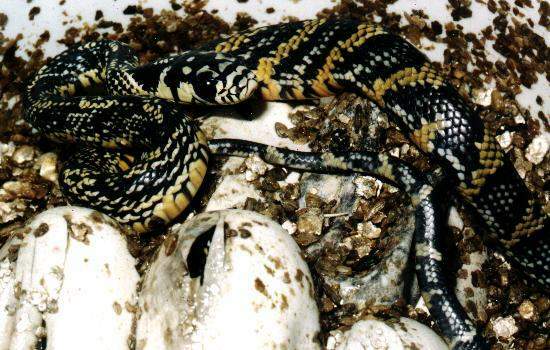 Mexican tiger rat snakes are oviparous and the hatched young resemble their parents. The colors of young snakes may become either a little darker or paler as they age, depending on subspecies or population, but there is no dramatic change in pattern. 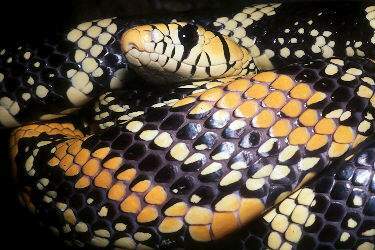 Some juvenile Tiger Rat Snakes have deeper golden or orange banding around the midsection; only the Mexican subspecies retains the deeper color as the adult. 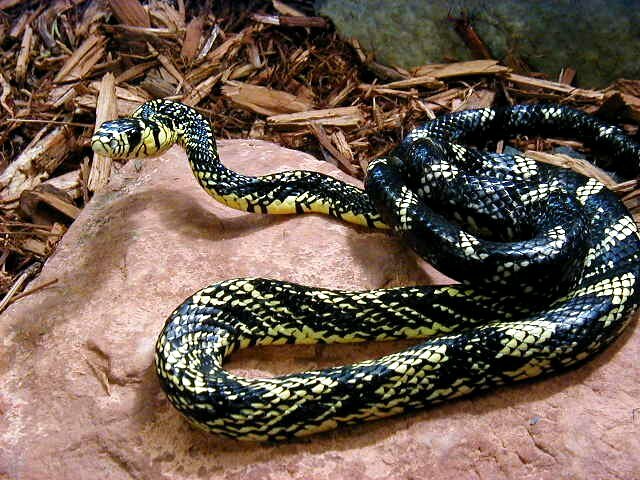 There are several subspecies of this snake, with varying amounts of black and yellow in their pattern. The growth of snakes is indeterminate -- they continue to grow throughout their lifetimes. 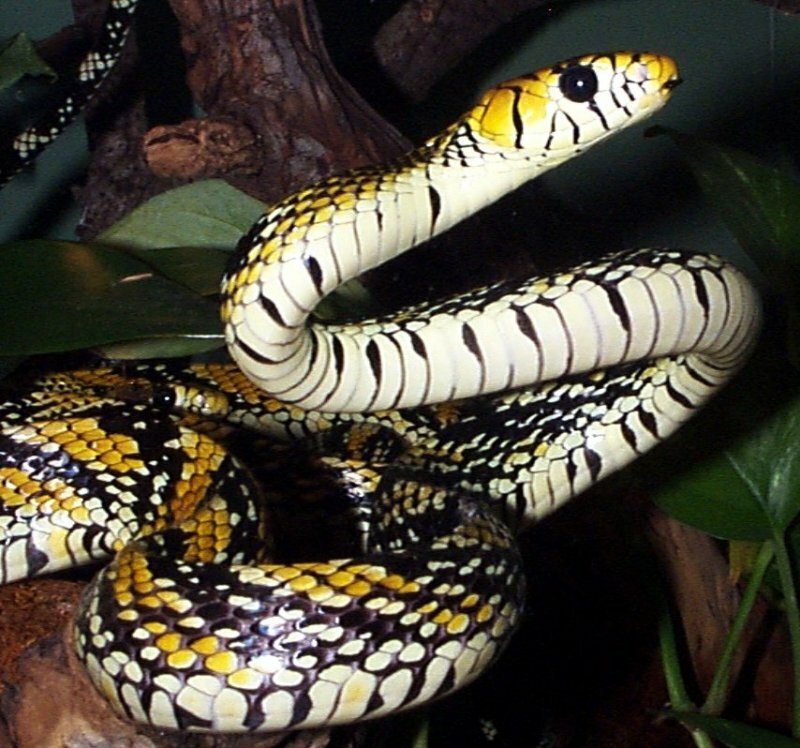 The Mexican Tiger Rat Snake is a superb hunter. Their primary sense for seeking out prey is their acute eyesight. With very enlarged eyes, their vision ranks among the highest of all serpents. They seem to gauge distance by trangulation, moving their heads from side to side like a hawk or owl. Their other deadly weapon is their speed. 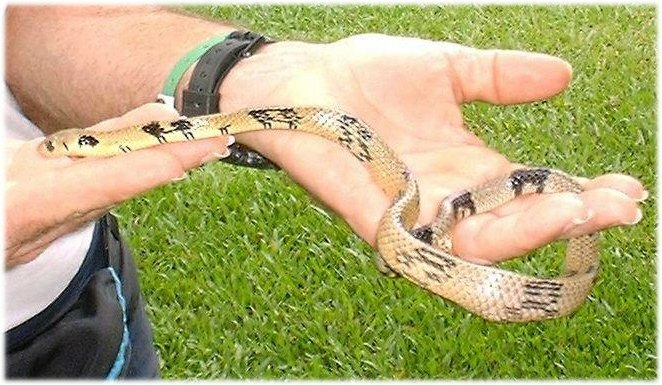 Mexican Tiger Rat Snakes are extremely quick and by the time their prey has spotted them, it is usually too late. Although they are capable of constricting their prey, they normally just swallow them alive. They have indeed been described as being one of the "the fastest ophidian swallowers in the West (Blais)." Mexican Tiger Rat Snake at the Fort Worth Zoo. 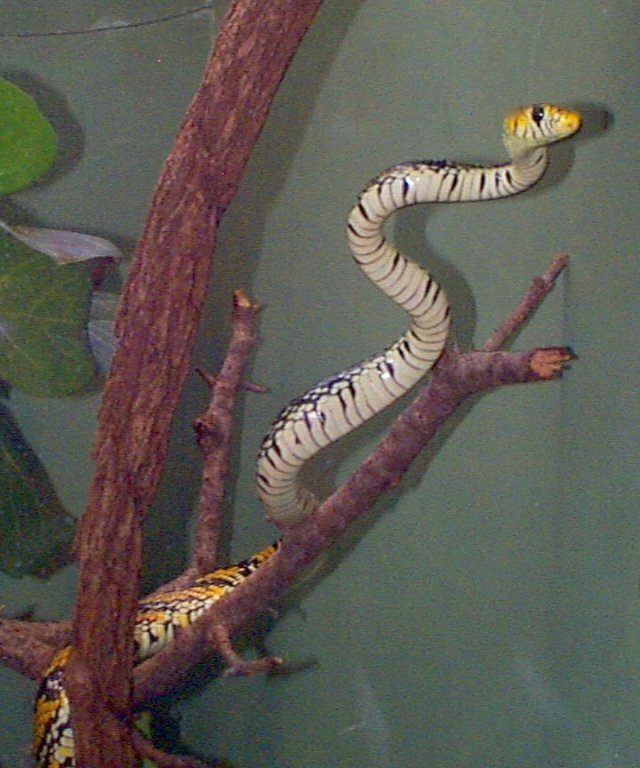 The Fort Worth Zoo has one male and one female Mexican Tiger Rat Snake. However, the zoo has been yet to hatch any babies from the fairly juvenile pair. These two snakes can be very rewarding to watch because they are usually active during the day, unlike many of the more nocturnal snakes at the zoo. Unlike many of the snakes that can be found at the Zoo, these two snakes always seem to be exploring the confines of their provided habitat. Maybe they are just curious by nature, or maybe they are looking for a way out! Special thanks to the Fort Worth Zoo and their helpful placard. Special thanks to Bill Gillingham for information and photos. Special thanks to Jim Kavney for information and photo. Ditmars, Raymond C. A Field Book of North American Snakes. Doubleday & Company, Garden City, New York. 1939. Many thanks to Dr. Jonathan Campbell for information about juveniles in wild populations of Spilotes pullatus. WhoZoo is also indebted to Dr. Michael Dixon, who tapped into the intellectual wealth of the Herp Listserve in search of information about juvenile Spilotes pullatus and to his generous respondents for sharing pictures and information about this beautiful snake: Philippe Blais, Gad Perry, Bob Wallen and Julian Lee. R.D. Bartlett was also very kind in allowing WhoZoo to reproduce his photo of a gold-banded Mexican Spilotes.